When you are time pressed and need the carpets ready as quickly as possible what you need is dry cleaning. As per the name, the entire process uses non-wetting products to get the carpets cleaned. Many consider dry cleaning to be the best way to get carpets cleaned. The method is proven to be quick and does not require any drying time, which is the setback for methods using water based cleaning solutions. Apart from routine residential carpet cleaning, dry cleaning is the preferred method in offices, restaurants that remain open 24 hours, convenience stores and businesses with workers round the clock. Experts such as Sunbird Cleaning Services Charlotte believe that dry cleaning gives the carpets a clean and fresh look. Moreover, there is no shrinking or buckling effect observed on carpets. Dry cleaning is especially recommended for wool carpets. Simply put, the dry cleaning method of carpet cleaning begins with application of pre-conditioners that break binding of soil and dirt to carpet fibers. The chemical dissolves the organic dirt effectively. Solvents such as glycol ethers, butyl agents, petroleum byproducts, d-limonene etc are part of solution that is sprayed as pre-treatment. Then a buffer is used to scrub in the cleaning powder or agitate it. The dry residue is vacuumed off leaving carpets as fresh as new. Dry compound - a biodegradable cleaning compound is spread on the carpet and scrubbed into it. The dirt and grime accumulated in the carpet is attracted to the cleaning powder and gets attached to it. This complex of cleaning powder-dirt is vacuumed off. The carpets are clean almost immediately. Encapsulation - the cleaning solution is applied using a rotary machine. On contact with dirt and soil particles, deep cleaning compound dissolves and encapsulate it forming a dry residue which is vacuumed off. This method is particularly popular for carpets with high traffic. Bonnet - a mist of cleaning product mixed with club soda is scrubbed onto the surface of carpet in a rotating motion by a bonnet. The absorbent pad attracts dirt and is replaced repeatedly. This is not strict dry cleaning and requires some drying time. Dry cleaning of carpets work better, are easy to use, saves time and money, requires less training as well as leads to less re-soiling. They are gaining market share particularly due to their less drying period which is a very vital factor where commercial installations of 24 hours are concerned. Dry cleaning of carpets are best done by the professionals of carpet cleaning Charlotte and it is important to choose a carpet cleaning service provider which doe vacuum cleaning of carpet prior to actual cleaning process as well as treating spots and stains. 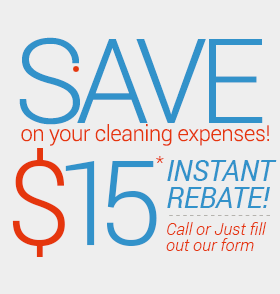 Dry cleaning Charlotte offers thorough cleaning of your carpets. Call Sunbird Cleaning Services at 704-209-9333 to learn more about our cleaning services at your home and office.